I reported just before Christmas that a 12-club National Baseball League (NBL) was being considered in Britain, with three four-team pools, two in the south and one in the north. An official release came on 1 April from the British Baseball Federation (BBF) to announce that the NBL will in fact be eight teams this year. Disappointing though this may be for some, the new set-up is still an expansion of three teams from 2009. However, the geographical spread of the eight teams equates to a second season without any top-tier representation from the north of England. 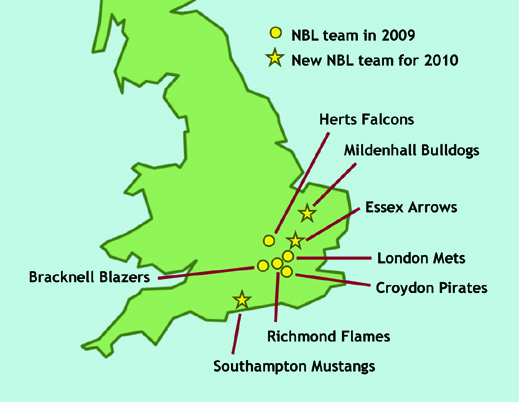 All five NBL teams from 2009 remain in the top tier, those being the BRACKNELL BLAZERS, the CROYDON PIRATES, the HERTS FALCONS, the LONDON METS, and the RICHMOND FLAMES. The three new entrants are the ESSEX ARROWS, the MILDENHALL BULLDOGS, and the SOUTHAMPTON MUSTANGS. League Format: Teams play 4 games against each of their opponents. Postseason: teams finishing in first and second place progress automatically to the National Baseball Championships. Teams finishing third, fourth, fifth and sixth will have to win in a single 9-inning playoff game to progress (see Postseason Playoffs and NBC section below for full details). The teams will play a schedule of 28 games (four against each opponent) over 15 weeks, which comprises 13 double-headers (seven-inning games) and two single contests (nine-inning games). Teams finishing in first and second place will progress automatically to the National Baseball Championships, while teams finishing third, fourth, fifth, and sixth will have to win a single nine-inning play-off game, scheduled for 28 August, in order to progress (the third-place team will host the sixth-place finisher, while the fourth-place side will host the team ending the regular season in fifth). The National Baseball Championships are set to take place on 4 and 5 September, and the BBF should be confirming the format by 9 April. A map showing the geographical spread of the eight NBL teams in 2010 is provided below. Joe Gray is league statistician for the National Baseball League and is the founder of Project Cobb (the Project for the Chronicling of British Baseball).